Humans need to have sufficient amount of dietary fiber intake as consumption is associated with a lot of health benefits. What is dietary fiber found in? It is mostly found in whole grains, fruits, vegetables and legumes. It is best known for its ability to relieve and even prevent constipation; and other health benefits such as lowering the risk of cardiovascular-related health disorders and diabetes. Dietary fiber is also called as bulk or roughage, and these terms include all parts of plant foods that cannot be absorbed or digested by the body. Fiber cannot be digested unlike other food components such as proteins, carbohydrates and fats. It passes relatively intact through the stomach, small intestines, colon and then out of the body. Although most people think that fiber isn’t much needed in having a healthy body, it is actually very important and has numerous important role in keeping one’s health. 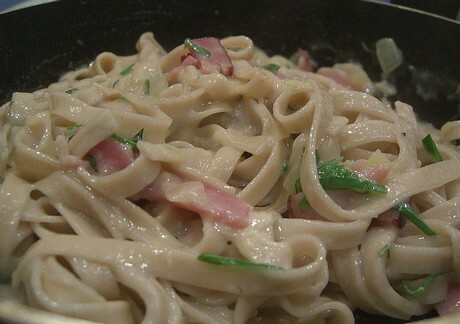 Many delicious meals such as Carbonara can have their fiber content boosted by the use of high fibre fettuccine. So how is dietary fiber defined? Well it is mostly classified into two categories: the soluble fiber (dissolves in water) and the insoluble fiber (those that do not dissolve in water). Soluble fiber can be dissolved in water and forms a gel-like substance. It aids in lowering glucose and blood cholesterol levels. Soluble fiber is mostly found in beans, peas, oats, apples, carrots, psyllium, barley and in citrus fruits. Insoluble fiber on the other hand, promotes the movement of material through the body’s digestive system and helps in increasing stool bulk. This is mostly needed by those who are struggling with irregular stools and constipation. Good sources of insoluble fiber include wheat bran, whole wheat flour, nuts and various kinds of vegetables. In order to get the best health benefit, one should take a huge variety of foods that are high in fiber as the amount of each type of fiber differs from one food to another. Having a diet that includes fiber rich foods is essential for several reasons such as fiber helps in normalizing bowel movements. Dietary fiber increases the size and weight of a person’s stool and softens it. Constipation can be prevented as bulky stools are easier to pass and for those who have watery and loose stools, fiber can also aid in solidifying the stool due to the fact that it absorbs water and adds bulk to stool. Many health experts recommend increasing fiber intake to be relieved from irritable bowel syndrome. Dietary fiber also helps in maintaining bowel health and integrity. It lowers the risk of the hemorrhoids development and small pouches in the colon, which is also known as diverticular disease. Since there are some fibers that are fermented in the colon, this also plays a role in preventing colon-related diseases. Dietary fiber also lowers the levels of blood cholesterol. Soluble fiber that are found in oats, beans, oats and flaxseed can help lower total blood cholesterol level by means of decreasing the so-called bad cholesterol levels or the low-density lipoprotein. Epidemiologic studies have also shown that having huge intake of fiber can actually reduce blood pressure and inflammation that is a protective to the health of the heart. Blood sugar levels are also controlled by dietary fiber. Since fiber is particularly a soluble fiber, it slows down the sugar absorption which can help those people with diabetes. A good diet that includes insoluble fiber is also associated with the reduced risk of the development of type two diabetes. Fiber is a heaven-sent gift for those who want to shed off excess pounds in their bodies. This is because dietary fiber helps in weight loss. Since foods that are rich in fiber require more time to be chewed, it gives the body sufficient time to register that it is no longer hungry, thus making a person stop from overeating. A diet that is high in fiber also tends to make a meal linger longer and feel larger, so individuals stay full for a longer period of time. The National Academy of Sciences’ Institute of Medicine, responsible in providing science-based advice on health and medicine related advice, recommends that adults need to have the following fiber intake per day: men who are 50 years old and younger needs to have 38 grams of fiber daily and those men who are older than 51 years old should have a daily 30 grams of fiber intake. On the other hand, women who are 50 years old and younger should have 25 grams of daily fiber intake per day while those who are more than 51 years of age, should have 21 grams of fiber daily. Foods that are good sources of fiber include fruits, vegetables, nuts, seeds, beans, legumes and peas; and processed or refined foods such as pasta, white bread, canned fruits and vegetables. Fiber rich foods are best taken in the morning in order for the stomach lining and intestine to be cleansed properly. Useful Information: Wikipedia, Medlineplus, Colorado State University, Dietary Fiber Food, Mayoclinic.